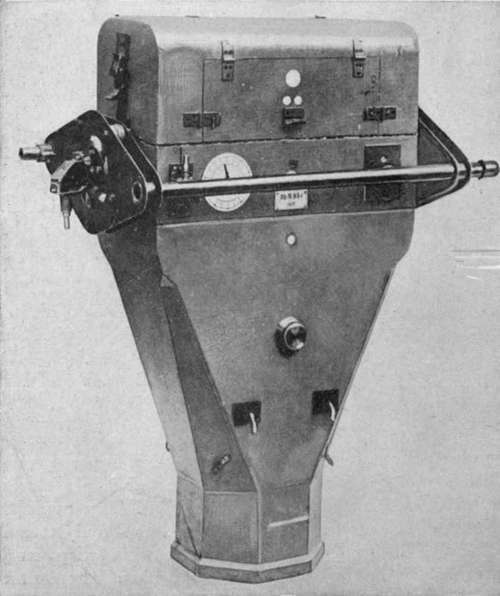 The German Film Mapping Camera, shown in Fig. 61, is distinguished by a number of special features. The size of the pictures, 6X24 centimeters, is unusual. It has its advantages, however. Since the short dimension is in the line of flight, the maximum width of field covered by the lens is utilized (Fig. 17). This of course necessitates a larger number of exposures to complete a strip, which is perhaps an added advantage, since the narrower the individual pictures the better the junctions will be, especially if large overlaps are made. This proved to be the case with captured German mosaics. Difficulty is experienced in making overlaps on a turn (Fig. 62), but this is not a vital objection. The shutter has a fixed aperture, narrower at the center than at the ends, to compensate for the falling off in illumination away from the center of the lens. No safety flap is needed because the curtain moves in opposite directions on successive exposures, thereby also compensating for shutter distortion, as has part of the circumference, allowing the film to stand still until they bite again. A yellow glass pressure plate holds the film during the exposure and serves as color filter also Fig. 63). An electric heater is provided near the shutter, as in all the later German cameras. Fig. 61. - German automatic film camera. The camera is driven by an electric motor, connected to a set of gears, whose shifting provides for speed variation. 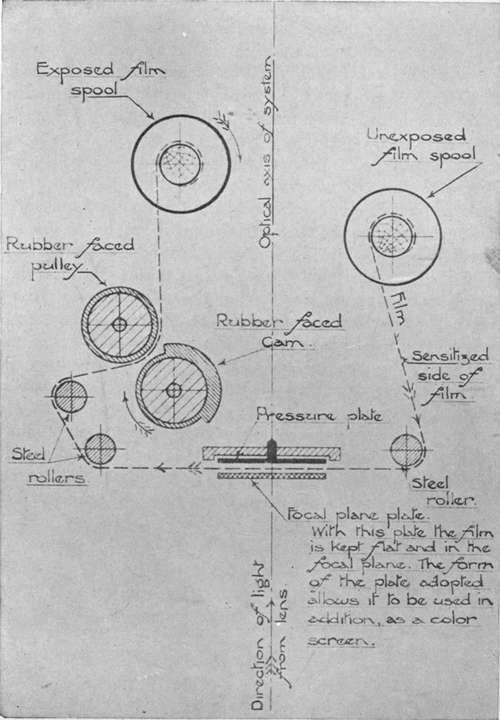 The film is moved by rubber rollers which are cut away for already been discussed. Shutter speed is controlled by varying the tension of the actuating spring. Fig. 63. - Film winding and exposing mechanism in German film camera.